In my very limited experience thus far with indigo I have found that it dyes carb based fibers ( like cotton, linen and hemp) better than protein based fibers ( like silk and wool) so I was really pleased with the result I got this past weekend with dyeing some 100% wool felt. You might remember the curious cylindrical pieces from this photo. I have to admit when I unwrapped them I was completely taken with the imprint on the wood almost as much as the wool. I like that those of you who visit my flickr stream were intrigued by the image of a brand new substance I got in the mail to play with. It is kakishibu. ( I am sure that really helped). It is a powder derived from fermented persimmons and is a traditional dye stuff from Japan that can be mixed and then painted on. I have read many a warning about its smell but after working with indigo and woad fermentation vats all summer I find its smell quite pleasant. I first mixed it to a good gel like consitency and was just playing around with it on that indigo dyed piece of bookhou fabric. I love the color as is but the amazing thing about this stuff is that it gets better with time. Most natural dyes are light sensitive and fade with time but they say this will darken and become richer with time. I find that really fascinating. It also has other properties that I will show you on the next little experiment. ( maybe tomorrow). everything but the covered stones 2010, originally uploaded by knitalatte11. Things happen when you surround yourself with bird loving friends. I saw a beautiful woodpecker in the forest and I have started my next bird embroidered on a vintage hankie, a chickadee. What sort of birds have you been seeing? Geninne is selling some gorgeous originals in her big cartel shop. The medicine shields are finished, wearable and all set for the trip to gallery hanahou's show that start December 9th. 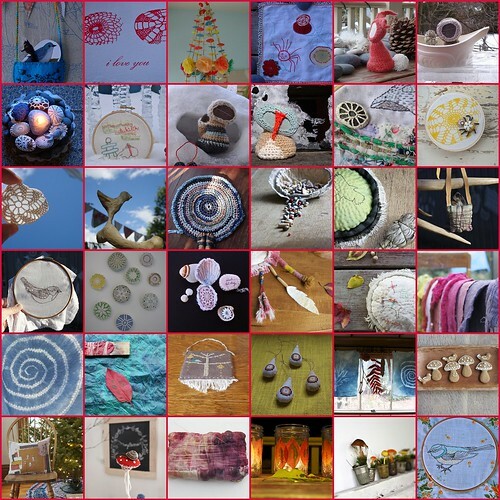 There are so many amazing artists making gorgeous things that will be available for purchase and gift giving. I am sending three wearable shields but of course if you prefer not to wear them they would also look great hanging up somewhere special in your home. You can read more about them on earlier blog posts. How about that ophelia in the leaves? The last dyeing class at the workroom in Toronto involved shibori techniques of stitching, wrapping, tying, folding and clamping and then dyeing in the magical indigo vat. It also involved preparing the vat which was quite magical and really intriguing for the chemist in me since it involved reduction and oxygenation. I was a little puzzled about why the silk and wools seemed to not dye as strongly as with the other natural dyes until I did some reading about the actual chemical structure of indigo. It is a glycoside, which really means it is a sugar or carbohydrate based dye, not a nitrogen based one. To me as a former chemist that means it will in its reduced form bind better with other carbohydrate based polymers such as plant based fibers ( cotton, linen, hemp, rayon) and not protein based animal fibers such as silk and wool. Enough of the chemistry and on to the inspiration for my shibori designs. No big surprise that they were nature inspired. For my stitched pieces I used the sea fan ( although I agree it does look very tree like as some have suggested) and the spiral of the snail. For the tying samples I used mushroom spore prints and sand dollars as inspiration. I used screws, washers, plungers from syringes and what ever else I could find to tie and wrap around. I also used pebbles to tie around for one of the t shirts and a pair of cotton undies. I used pole wrapping with silk but it was very faint even after dyeing a few rounds. I did a little second pole wrapping with cotton flannel at home with a jar of left over indigo , resurrected with a touch of draino ( yep it worked). I haven't taken detailed pictures of everything yet but I even have some indigo cotton tights, undies, tank top, short and long sleeved t shirts and so much more. Can you tell I am smitten? I realized after seeing arounna's beautiful and colorful swatches today that I had not yet posted pictures of my rainbow of fabrics and fiber. Thanks Julie for such a wonderful set of classes. I can't wait to get the supplies I ordered to do some more larger scale dyeing, hopefully before winter. My favorite colors came from the osage, logwood and indigo. I hope to do some more indigo dyeing so I can dip many times to achieve a darker blue shade. I also am very keen to try some of the shibori and dipping techniques using other natural dyes. I love that piece of silk first dyed in osage after mordanting with alum and tartar and then overdyed with indigo. The other fibers dyed above are cotton, linen, silk, wool felt, vintage crochet cotton for some future covered stones, merino wool roving, unspun cotton and some vintage linen with lace. I have many more specific images of the indigo / shibori class results but I will save them for tomorrow to give me a little more time to talk about my inspirations. You can read my earlier post on the inspiration for this embroidery here. I really love how this one unfolded with the extra fringe of hand dyed felt and the tassels, oh the tassels. I am quite smitten with the tassels. The little animal, just in case you didn't read the link above is a mole. Thanks for all the encouragement with my current projects.